Susannah Sayler and Edward Morris (Sayler / Morris) work with photography, video, writing, installation and open source projects. A primary concern of their work is to engage both contemporary efforts to develop ecological consciousness and the opportunities that art offers for social movements. 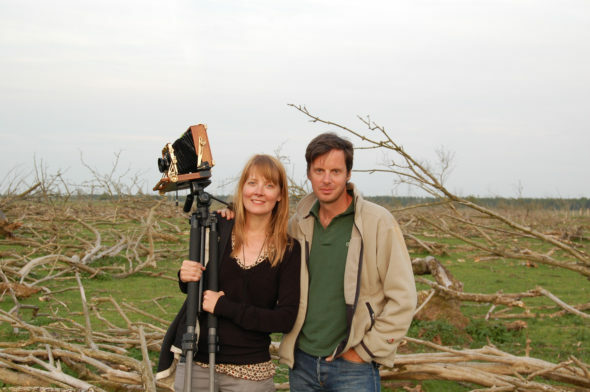 In 2006 they co-founded The Canary Project – a studio that produces visual media and artwork that deepen public understanding of climate change and other ecological issues. Sayler/Morris have exhibited internationally at many venues, including both science and art museums. Some past exhibitions have featured at the Massachusetts Museum of Contemporary Art, the Harvard Museum of Natural History, the Nevada Museum of Art, the Cooper Hewitt National Design Museum, the North Carolina Museum of Art, the Kunsthal in Rotterdam, the Museum of Science and Industry in Chicago. They have been awarded the David Brower Center’s Art / Act Award (2016), the Robert Rauschenberg Foundation Residency (2015), the Smithsonian Artist Research Fellowship (2014) the Loeb Fellowship at Harvard University’s Graduate School of Design (2009). They are currently teaching in the Transmedia Department at Syracuse University, where they co-founded The Canary Lab. Their archives are collected by the Nevada Museum of Art / Reno, Center for Art and Environment. Water Gold Soil: The American River tells the story of a single flow of water in present-day California, from origin point to end-use. The project is both a form of historiography and a form of allegory – using this swath of geography to investigate our present Age of Extraction. With Water Gold Soil, the artists examine this less visible, technological reality of California rivers by following a single flow of water – the South Fork of the American River – from its origin near Echo Summit in the Sierra Nevada mountains to its end use in the agricultural economy in California’s Central Valley. This is the flow of water where gold was first discovered in California, and the project explores how the state of California remains haunted by its violent and colonial beginnings of the state of California. The project consists of an ongoing assembly of original photographic and video works, archival images, writing, maps and other media. All of the elements are combined to produce installations that take the viewer through a series of conceptual frameworks. The diversity of form and materials in the project stems from an appreciation for the challenges of representing the nexus of relationships–ecological, political, and historical–that make up a river. A book of the project will be published in spring 2019. While at Berkeley, the artists will continue to investigate the way ideology informs the use of technology in water management and allocation. They will research current technological innovations that help prepare California for future water shortages, particularly in light of climate change and increased demand. They will also research what ways of seeing the world might lead to a more equitable and sustainable use of existing and emerging water technologies (e.g. the commons, indigenous philosophies, critiques of neo-liberalism, history of water law). They are preparing additional exhibitions of the work to follow the book, as well as a related made-for-TV documentary series that they are producing along with Paul D. Miller (aka DJ Spooky) and director Stefan Schaefer. The Center for Science, Technology, Medicine & Society (CSTMS), in partnership with the Arts Research Center (ARC), hosts an artist-in-residence program that will focus on nurturing exchanges between art, design, technology, science, and engineering at UC Berkeley, in the Bay Area, and across the region. The Center for Science, Technology, Medicine & Society is a research unit at UC Berkeley dedicated promoting rigorous interdisciplinary research based on the conviction that the pressing problems of our time are simultaneously scientific and social, technological and political, ethical and economic. The Arts Research Center is a think tank for the arts. It acts as a hub and a meeting place, and provides a space for reflection where artists, scholars, curators, and civic arts leaders from a variety of disciplines can gather and learn from one another. The Art+Science in Residence program will host artists who are drawn to collaboration, interested in interdisciplinary artistic, scientific and technological dialogue, and open to developing new working methods and research techniques. If you are interested in participating in the program, please contact us at our email address, listed below. Projects can take myriad forms, such as multimedia performances, theatrical productions, animated film making, immersive installations, walking tours, community based research and online projects. We welcome diverse interpretations of our core themes, ‘art’ and ‘science.’ The program embeds artists within the unique culture of the Center and UC Berkeley at large. It affords access to a dynamic and diverse community of scholars, visitors, staff, and provides opportunities for exposure to a broad public. While the Center accommodates different scheduling needs, residencies typically unfold over one year and include both an exploratory and project-development phase. Henry Schmidt is a graduate student in the History Department at U.C. Berkeley. He studies the history of science. For the 2018 – 2019 academic year, he will serve as the Art + Science Residency Program’s Graduate Student Researcher, documenting the program’s evolution as an experiment in the combination of art and science.